Last weekend JediBFA and I escaped the great white north, also known as Ohio, to soak up some Florida sunshine, visit our good friends, the LanceAround family, and check out the new Harry Potter attraction at Islands of Adventure. Following LanceAround’s advice from the previous post, we arrived at the park 30 minutes before it opened. One might imagine that would mean we’d get some rockstar parking. One would be wrong. Park employees filled in the parking lot row by row which meant that even though there were tons of close spots, we were forced to park at the far end of the garage. Not a huge deal in and of itself, but certainly an example of how Universal’s policies are more concerned with their own convenience than with the customer’s experience. JediBFA and I ended up riding several rides on our own, not because LanceAround didn’t want to join us, but because the seats on many of Universal’s most popular rides have a very limited capacity. While unlike LanceAround I was not bared from riding, the seats were tight enough that as a woman with generously sized hips I was pretty uncomfortable most of the time. As LanceAround is fond of pointing out, it doesn’t have to be this way–Disney finds a way to make all of their rides accessible to people of all sizes. It may seem like a small thing but feeling judged by inanimate objects does not lead to a fun-filled day at the park. This was the worst part of our experience. In fact, if this piece had been better, I might not have consciously noticed the problems with the parking and the rides. With the exception of the Butter Beer in the Harry Potter section of the park, the food and drink options were extremely average–for an omnivore. For vegetarians and vegans it was worse. As vegetarians and frequent visitors to the park, the LanceAround family knew the options for eating a full meal at the park were limited, so we headed off to Jurassic Park where veggie burgers were on the menu. JediBFA ordered without incident. After finding the single cheeseburger on the menu (it was cleverly hidden under the very prominent double cheeseburger option), I also placed my order. I wanted onion rings but ordered fries since no affordable way to sub one for the other was offered. We went to the table to eat our very underwhelming, dried out, lunch. Ordering took quite a bit longer for the rest of our party as the kitchen staff (at the only restaurant with vegetarian options on that side of the park) were not able to confirm if the veggie burgers were also vegan. Not only did they not know–they were reluctant to find out. When pressed, their response was “I don’t know–I’m not a vegetarian.” When pressed harder, they did find an ingredient list (and subbed the original non-vegan bun, which had egg wash, for a different one without egg wash) so everyone got to eat–after returning one of the delivered chicken sandwiches for the veggie burger that was actually ordered. In the end, everyone ate so no actual harm was done–and yet, by making everything just a little harder than it needed to be, what should have been an amazing day in the park, ended up involving just a little more work than one wants to do on vacation. Am I suggesting you skip Universal? Not at all. We had a pretty good time, and the Harry Potter section of the park was amazing. In fact, if you have no dietary restrictions, weigh under 200 pounds and and have no experience with Disney theme parks, you may not even consciously notice the corner cutting. 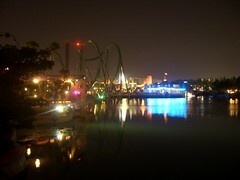 If, however you visit only one park while in Orlando–Disney is certainly a better bet. For those of you who own businesses or work in marketing, there is another lesson. Thanks to the Internet and social media, truly amazing customer service is more important than ever before. You don’t have to destroy property or have ridiculous refund policies to be called to task. Dismissing customer concerns because your cashier “is not a vegetarian” or even being in an industry where someone else is doing it much better is enough to cost you business. When she’s not deriving marketing lessons from theme park visits, Maureen Carruthers (known here as LizTheFair) uses her obsession with marketing to help nonprofit organizations be heard through social media. *When I mentioned this out loud over lunch LanceAround commented that even Disney isn’t always up to Disney’s standards anymore, but that’s another post. . .
Want to say something to me but not the whole internet? Send me an email. Add me to your RSS reader! We Offer You This Chilling Challenge – To Find a Way Out!